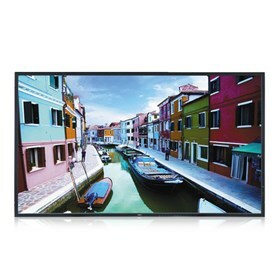 The NEC V463-AVT is a 46" edge-lit, commercial-grade display that delivers both environmental and functional benefits for digital signage. The display has 1920 x 1080 resolution that displays incredibly clear imagery and features AMVA Panel Technology. The LED backlighting allows for reduced power consumption while the carbon footprint meter enables responsible use of the display conserving green gas emissions in real time. The V463-AVT features an integrated OPS-compliant computer and comes along the NaViSet administrator software solution that eases large display device installations. The built-in ATSC digital tuner allows for high-definition broadcast capabilities. This monitor features 178° horizontal and vertical viewing angles and brightness of 500cd/m2. The NEC V463-AVT has many exciting features for users of all types. You can extend the lifetime of your NEC V463-AVT with the purchase of a FactoryOutletStore Factory Protection Plan. See the NEC V463-AVT gallery images above for more product views. The NEC V463-AVT is sold as a Brand New Unopened Item.